Red Eddies take key KVAC A showdown. AUBURN — On a field that is known to make the ball bounce a little harder and a little farther than most others, the home team received the friendly bounces that helped give it a big mid-season victory. 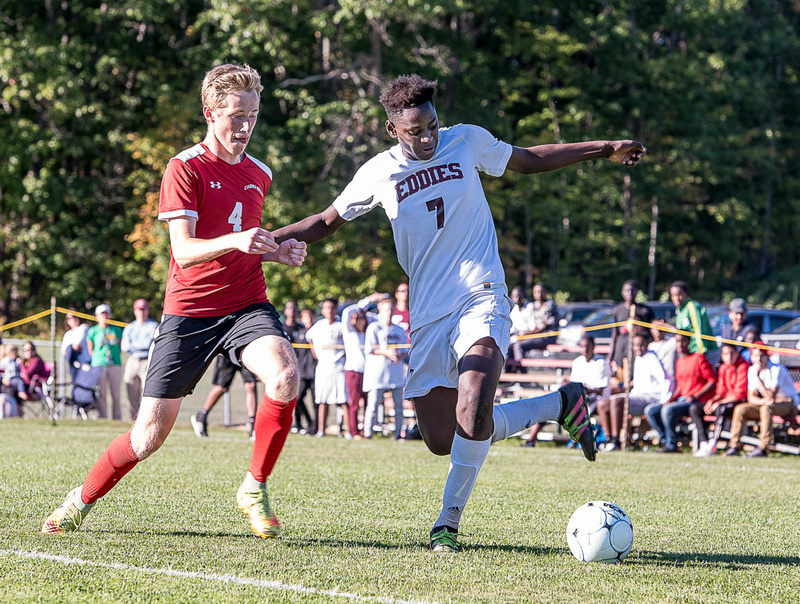 Edward Little used one of those bounces to score the only goal and win an intense Kennebec Valley Athletic Conference Class A boys’ soccer game against Camden Hills, 1-0, Thursday afternoon. Despite plenty of action, the game was scoreless approaching the final 10 minutes of regulation. The Windjammers (4-2-2) were able to stuff a cross from Joel Musese intended for Nick Hathaway, but Tyler Morin pounced on the loose ball at the top of the box and struck a low shot into the goal while Camden Hills goalie Lucas Boetsch was on the ground. The Red Eddies (7-1-1) had few chances to get a quality shot on Boetsch, but they were able to get the right opportunity at the right time. The Windjammers, meanwhile, had a few golden opportunities that were wasted. A Camden Hills corner kick late in the first half went through the box without a touch by either team. Early in the second half, Eliot Matlack couldn’t get a foot on a chance near the left post. Ben Owre tried tapping one in around the same spot a few minutes later, but the attempt rolled wide. Owre had a header and an off-balance shot both go wide right, and glanced a shot off the left post with three minutes to play. “There was plenty of chances, but ball didn’t bounce our way today,” Camden Hills coach Ryan Hurley said. Most of the Windjammers’ chances came off a counter-attack that Mains called “extremely dangerous.” Much of the visitors’ focus was on preventing the Red Eddies from getting chances. The Windjammers succeeded in that aspect. EL’s attack of Ahmed Safi, Musese and Christian Beliveau was able to get the ball into the box, but getting shots off proved difficult. Defender-turned-midfielder Alex Thompson also wasn’t able to find many openings for longer shots. Boetsch was called up into the offensive end late in the game to take free kicks. He was able to show off his booming leg, but each blast went for naught. Boetsch made four saves in goal for the Windjammers, while EL goalie Noah Sterling stopped all three shots he faced on goal. “They’re a top team, and I consider us a top team. So any time we can come out with a win against a good team like that, I’ll take it,” Mains said. Hurley said he wouldn’t mind seeing the Red Eddies again in the playoffs.